On June 27, a hit-and-run driver slammed into a pedicab on the Embarcadero near Pier 29, injuring a family, including two children. The pedicab operator, Kevin Manning, later died of his injuries. There’s a sad irony to this. If the family had stayed home and gone for a bike ride on Vancouver’s waterfront, it’s unlikely they would have been in a serious crash, because they wouldn’t be riding in the street with traffic in the first place. Vancouver’s seawall promenade is comparable to the Embarcadero promenade in most respects. But in Vancouver’s case, there is an ongoing project to organize and segregate the space, so it is actually usable for both cyclists and pedestrians. And here’s a short blog post about it. 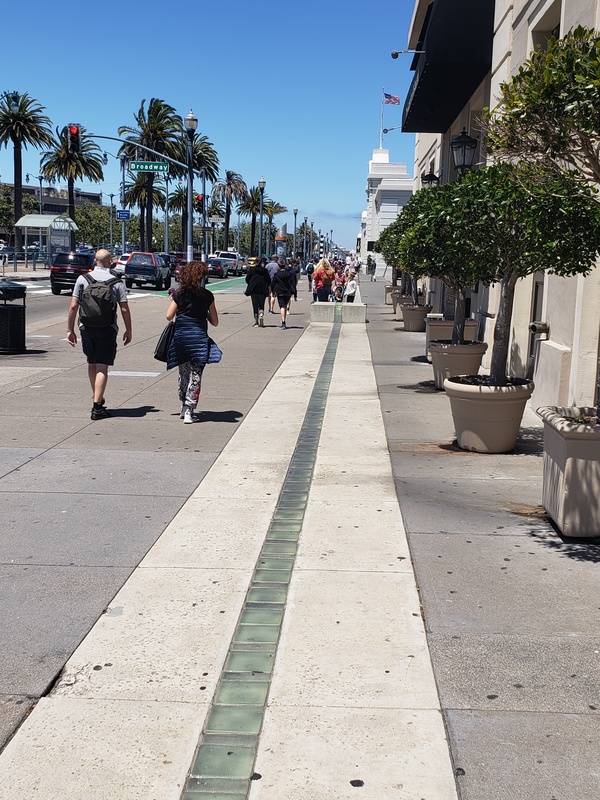 Technically, San Francisco’s Embarcadero promenade is already one of the few spaces in the city where cyclists are permitted to use the super-wide sidewalk, but it’s not often practical to do so because it’s so chaotic and disorganized. Cyclists are constantly trapped behind groups of pedestrians–you spend the whole ride shouting “excuse me!” Pedestrians get flummoxed by cyclists passing too close. Close calls are inevitable. Many people don’t even realize bikes have a right to be there, so conflicts are inevitable. As a result, for the most part, bikes and pedicabs are forced onto the Embarcadero’s unprotected bike lane next to speeding traffic. Vancouver had similar issues until they started dividing the seawall path between walking space and cycling space a few years ago. In different parts, it is done with benches, planters, street art, curbs, etc. None of this is to suggest that SFMTA’s current bike lanes–or the long-term plan to upgrade them–should be removed or abandoned. But for pedicabs, bike tourists, and people who just want a calmer biking experience, why not carve out some clearly defined, bike space on the promenade? Plug some signs into appropriate parts of the ribbon that point bikes to one side and pedestrians to the other. Add a few planters, and, for a good stretch anyway, you’re done. Some sections already have concrete blocks, so the city would literally only have to put in signs and maybe paint a stencil or two. They could even use San Francisco’s favorite on-the-cheap tool: safe-hit posts. Is this the best solution? Who knows? But it could be done in a matter of weeks or days. It doesn’t require studies, environmental reviews, etc. It just requires the city bureaucracies to stop dithering, prioritize safety, and do something. From the San Francisco Bicycle Coalition’s statement about Manning’s death: “between 2006 and 2011, data shows that 84 people were injured on the Embarcadero while biking or walking, including two fatalities.” In other words, it’s just a matter of time before the next crash. https://www.youtube.com/watch?v=Q2cN5cSeEFo&t=423s I guess cyclists will never face reality. It is the attitude and behaviour of cyclists that is the problem. No infrastructure will change that. Here are cyclists on the sidewalk on the Embarcadero just seven months ago. Nothing is going to stop them from endangering the pedestrians. They simply don’t care. People walking on sidewalks are just objects in their way. I don’t think that such broad, sweeping generalizations about bicyclists are necessarily correct, but since bicyclists have made just such generalizations about motorists, it’s not surprising for them to be hoist with their own petard. Seems like a reasonable proposal, however, the same arrangement at Crissy Field and on the Golden Gate Bridge shows somewhat marginal compliance by pedestrians and cyclists. No one in SF likes to be told to follow the rules and tourists don’t understand them. The author must picked wrong day to ride since I don’t recall ever needing to say anything. I simply slow down and go around. Not much different than going around a stopped car trying to turn right. That’s been my observation as well. The majority of cyclists are fine, but it’s the visible and obnoxious behavior of a few that wind up diminishing the entire group. I don’t think that will work except perhaps for the plaza directly in front of the Ferry building. In other areas, the promenade is not wide enough. In those areas where the green bike lane is flush with the sidewalk, the sidewalk could perhaps be widened. I mean, they were pretty clearly in the road too endangering cars, so maybe it’s just them who are the problem, not the proposal. I don’t think any group should be characterized by the worst-acting members of that group. It’s just bigotry. I’m not saying that all bicyclists behave badly, just that this specific group was. I also HIGHLY doubt that any of them are the ones leading the advocacy efforts of SFBC, but I could be wrong too. Come to think of it, last couple of times I used it I was going from the ferry building to Mission Bay or Caltrain–I think there was a Giants game. So, yeah, wrong days to ride. Did the cognitive dissonance of making both of those comments in the same thread hurt at all? That is a true statement. Bicyclists have made such generalizations. You said that people shouldn’t generalize about groups based on the actions of a small subset of the group, but that you are okay with doing so in the case of cyclists because of… the actions of a small subset of the group. Yeah, no cognitive dissonance there. Carry on. diminishing the entire group in the eyes of people who lack the basic life skill of understanding that the behavior of a few people in an arbitrarily defined group actually says nothing at all about the rest of the group. I’ve seen plenty of incredibly obnoxious behavior in person by people who happened to be on foot at the time, and obnoxious comments online from people who identify as pedestrians. Would you say that “diminishes pedestrians”? Hopefully not, because it’s absurd to think that sharing nothing more than deciding to walk from point A to point B makes me fundamentally like other people who walk. The same is true for getting on a bike. The fact that people lump all cyclists together (like Cynara2 always telling people that they need to take responsibilty for the behavior of other people on bicycles) but don’t think the actions of other pedestrians or drivers define them is just out-group tribalism, pure and simple. Also bikes should have bells. For example, they are required to have bells by law in Germany. Saying you have to shout excuse me is like saying it’s hard to eat a steak because you don’t have a knife. That may be true, but it’s also human nature. Loud, visible problems created by a few people wind up getting the most attention. I don’t have an ax to grind here. I just don’t like getting buzzed in the crosswalk, which happens to me pretty frequently. That was very sad, but also 198 San Francisco traffic deaths ago. I’m a pedestrian who is about to give up on walking the Embarcadero. I walk it from the ferry building to my office on King Street and back. My complaint is with bicyclists who pass by me with inches to spare. It would be the majority of bicyclists from my experience who do this and not a few. It’s frightening to have people come nearly straight at you from the front or blast by you suddenly from behind. But why do I have to explain this? The strange thing is that I also bike and know this is a common complain bicyclists have about cars. So here we are with bicyclists treating pedestrians they way they hate to be treated by drivers! I really love the views of the bay from the Embarcadero, but like many people, I’m getting to the point where I’d rather walk up 2nd street and deal with the cars than with bicyclists on the Embarcadero.